"Tis the Season" for a FAST AND EASY solution that is sure to keep you in the holiday spirit while setting up your Christmas tree. 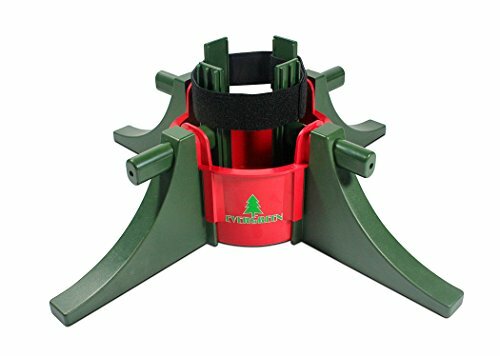 The Evergreen Christmas tree stand takes the hassle out of setting up your tree by removing the need for tree screws and additional tools. Click the four legs of the stand into the water basin. Place the four clamps into the top of the legs. Slip the large velcro strap onto one of the clamps and you are ready to insert your tree! Once assembled, the velcro strap and clamps are easily adjustable - making it a breeze to set up Christmas trees of various sizes (up to 10ft tall). Also, the Evergreen stand is made of high quality, strong injection molded plastic - making it durable enough to last for many hassle-free years to come. One-of-a-kind design allows for fast and easy assembly - No tree screws or additional tools required! Recommended for trees up to 10ft tall. Water basin holds one gallon of water. Made of high quality, strong injection molded plastic. Comes with manufacturer's one-year warranty.